The introduction of four bit per cell (QLC) NAND flash memory continues with Samsung's launch of their first consumer SATA SSD with QLC NAND. 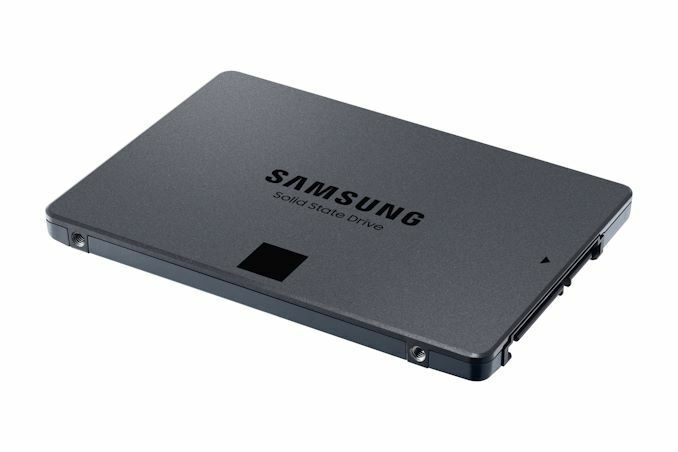 The new 860 QVO establishes a new entry-level tier in Samsung's highly successful SSD product family. Unlike previous low-end offerings like the 750 EVO and the plain 850, the 860 QVO is getting a broad release and is here to stay. The Samsung 860 QVO is the first of a new wave of SATA SSDs that should be able to beat the prices on even DRAMless TLC-based SSDs thanks to the increased density of QLC NAND—and the 860 QVO itself is equipped with a full-size LPDDR4 DRAM cache. 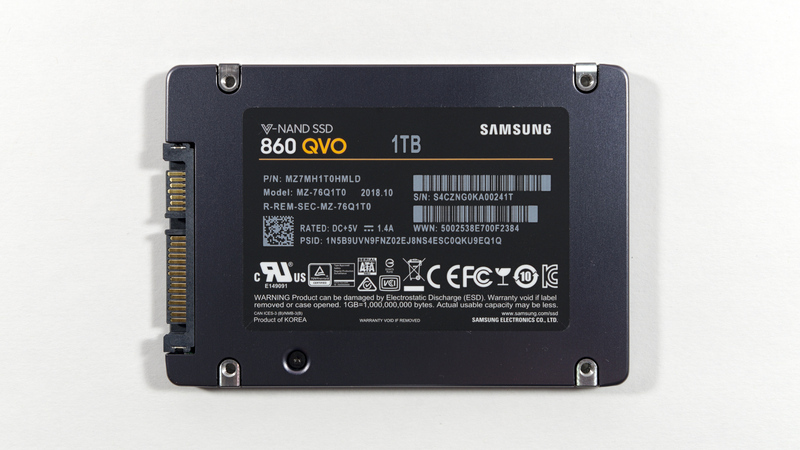 Samsung's consumer SATA product line now consists of the 860 QVO, 860 EVO and 860 PRO. The 860 QVO, EVO and PRO all share a common hardware platform based around Samsung's MJX SSD controller and their 64-layer 3D NAND, with the product tiers differing primarily in the number of bits stored per flash memory cell. The 860 QVO, from the box, is given a write endurace rating equivalent to 0.3 Drive Writes Per Day (DWPD), which even for the 1TB means 300GB a day, every day, which goes above and beyond most consumer workloads. Pricing is set to run at $150 for the smallest 1TB model, up to $600 for the 4TB model, making an equal cost per GB for the full range. It should be noted that the introductory MSRPs for the 860 QVO are not that aggressive in comparison to the record-setting sales we've been seeing on TLC SSDs recently. 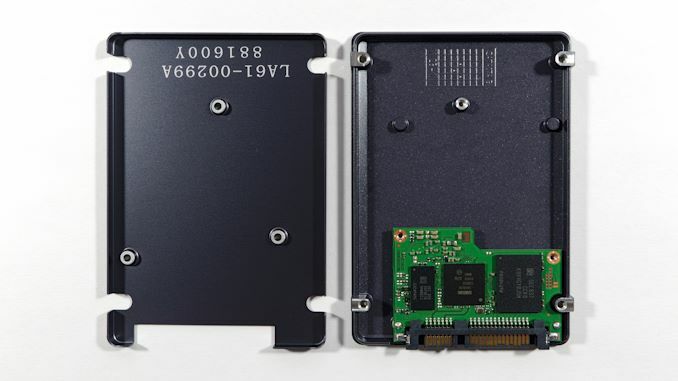 Two bit per cell MLC as used in the 860 PRO is now quite rare in the consumer SSD market and almost entirely absent from current enterprise SSD, having been largely replaced by three bit per cell TLC as used in the 860 EVO. With each increase in bits stored per cell, performance and write endurance decrease as SSDs need to be more careful to correctly discriminate between voltage levels, now up to 16 for QLC NAND. While controller advances and other NAND process improvements (especially the switch from planar to 3D NAND) allowed TLC to overcome almost all of its disadvantages relative to MLC, QLC NAND is not expected to do the same. Early projections for QLC NAND called for at most a few hundred program/erase cycles, which would produce drives that would require careful treatment with workload that treated the storage more or less as a write-once, read-many (WORM) media. As QLC got closer to mass production, the story shifted and it became clear that QLC NAND would have adequate endurance for use as general-purpose storage. Intel and Micron were the first to ship their QLC NAND, initially in the Micron 5210 ION enterprise SATA SSD and then in the Intel 660p and Crucial P1 consumer M.2 NVMe SSDs. The 660p and P1 introduced QLC NAND to the consumer SSD market, but as NVMe drives they still carry a price premium over SATA SSDs. However, as mentioned above, the introductory MSRPs for the 860 QVO are not at all aggressive in comparison to the record-setting sales we've been seeing on TLC SSDs recently. Those sales are not due entirely to the holiday season—flash memory prices in general have been crashing now that everyone has their 64-layer NAND in full mass production while PC and smartphone sales have been slowing. Meanwhile, rumors indicate that yields on QLC NAND have been poor, so the true cost is close to that of TLC instead of reflecting the ideal 25% discount per-GB. The two main shortcomings of QLC NAND relative to the more mainstream TLC NAND are in write performance and write endurance. Both problems can be alleviated by the use of more NAND total, allowing writes to be spread across more NAND dies in parallel. That and the (hopes of) lower prices make QLC NAND best suited for large capacity SSDs. Thus, the 860 QVO product line starts at 1TB. Even at that capacity, the 860 QVO only needs 8 dies of QLC NAND and can only sustain writes at 80 MB/s. That means that the SLC write cache on the 860 QVO is even more important than for TLC SSDs. When working within the cache, the 860 QVO can saturate the SATA link with random or sequential writes. The cache functions much the same as the SLC cache on the 860 EVO, with a capacity that varies from a minimum of 6 GB when the drive is relatively full, up to 42 GB on the 1TB model or 78 GB on the 2TB and 4TB models. The Intel and Crucial consumer QLC drives also feature variable-size SLC caches but with much higher limits on the maximum cache size and a policy of retaining data in the cache until the drive needs the extra space. By contrast, the 860 QVO seems to take a more typical approach of aggressively flushing the cache during idle time in order to prepare for future bursts of write activity. The performance specs for the 860 QVO when operating out of the SLC cache are typical for a mainstream SATA SSD. After the cache is full, performance drops significantly, with sequential writes showing the most severe effect. Power consumption is also comparable to Samsung's other recent SATA SSDs, with the 1TB model requiring a little over 2W at peak and the larger models drawing just over 3W during writes. The 2TB and 4TB models have very nearly identical performance and power ratings, indicating that 2TB of QLC is sufficient to populate all the NAND channels of the MJX controller. The warranty and endurance ratings for the 860 QVO are the other clear area where the use of QLC NAND has its impact. The 860 QVO's warranty period is three years, typical for low-end SSDs but shorter than the 5 years that the 860 EVO and PRO carry. Write endurance is rated for 360 full drive writes, or 0.3 DWPD for the duration of the 3-year warranty. This is comparable to some of the cheaper TLC drives currently on the market, and in terms of total bytes written the 860 QVO's rating is about 80% higher than the Intel 660p and Crucial P1, despite those NVMe QLC drives having the advantage of a five-year warranty. The 860 QVO's case follows the same basic design as Samsung's other recent SATA SSDs, but is painted dark gray instead of Samsung's traditional black. Internally, the 1TB 860 QVO illustrates how comically oversized even the 2.5" drive form factor is compared to the requirements of modern consumer SSDs. The PCB features three main BGA packages: the DRAM, the controller, and the stack of eight 1TB QLC dies. There's an empty pad on the back that can accommodate another NAND package. Samsung commonly packages up to sixteen NAND dies together, so even the 4 TB QVO may be able to get by with this same small PCB—placing DRAM becomes the more important problem. Samsung states that their current MJX controller supports up to 8TB SSDs, but there's clearly very little demand for consumer SSDs in that capacity yet. The 2.5" form factor itself can now accommodate at least 16TB, or 32TB if two PCBs are stacked in a 15mm thick drive. These capacities may show up in enterprise products, but are probably still several generations away from hitting the consumer SSD market. Samsung has not announced a M.2 version of the 860 QVO, but that's clearly possible if the demand is there. They can probably fit even the 4TB 860 QVO onto a single-sided 80mm M.2 card. The launch MSRPs for the 860 QVO do not compare favorably against SATA SSDs already on the market. The 860 EVO is currently below the QVO's 15 cents per GB at 1TB and 2TB capacities, and plenty of other mainstream TLC drives are priced similarly. Samsung currently has no competition in the 4TB SATA SSD space, so their 4TB 860 EVO is substantially more expensive per GB, leaving appropriate room below for the 860 QVO. In order to be a strong competitor in the consumer market, the 860 QVO really needs to priced at no more than 13 cents per GB, and that limit is liable to come down further over the next several months as flash memory prices continue to drop and QLC yields improve. Samsung provided us with samples of the 1TB and 4TB 860 QVO. Testing the 1TB model went smoothly, but the 4TB 860 QVO has run into some problems causing the drive to disappear from the system interface. These issues are most noticeable when hot-swapping the drive, which is a regular part of our SATA SSD testing routine. There have also been challenges getting the 4TB drive recognized by a motherboard during the boot process, and this causes the boot to stall indefinitely on some of our systems. It should be noted that our testing regime is fairly streunous, and we sometimes get drive failures. It happens, and only a few of them are ever drive specific. As a result, these problems do not appear to be specific to the 860 QVO or its use of QLC NAND and have been replicated on both the 4TB 860 EVO and 4TB 860 PRO with multiple host systems, but have not occurred with any of the smaller 860s. The 3.84 TB 860 DCT and the 4TB 850 EVO have also been trouble-free, so this isn't a problem with 4TB SSDs in general. We are still working with Samsung to determine the scope and nature of these issues with the 4TB drives, and it is not yet clear whether there is a general compatibility problem or if our testing procedure has triggered a firmware bug that put our samples permanently into an uncooperative mood. Because of these issues, some benchmark results for the 4TB drives have been delayed. Performance and price notwithstanding, I am unable to recommend any of the 4TB 860 series SSDs until I have a better understanding of the nature of the problems. There are no other consumer QLC SATA SSDs on the market yet, though ADATA has announced their SU630, which will feature alarmingly low capacities. The Intel 660p and Crucial P1 are the only other consumer QLC SSDs currently available, but they are priced for the NVMe market. Most of the competition for the 860 QVO will come from SATA SSDs with TLC NAND, both entry-level models with DRAMless controllers (eg. Toshiba TR200) and more mainstream models like the 860 EVO, Crucial MX500 and WD Blue. Almost all SATA SSD product lines feature a 1TB class model, but there are still relatively few 2TB models and no 4TB competitors have been announced. This will likely change as other QLC drives come to market, and even 2TB TLC drives have been getting more common this year. Sell me a 8 TB QLC SSD for $400 and I'll bite. That's what QLC is for: moving off of spinning rust and onto SSDs with my bulk storage. Until then, this is useless without MASSIVE price drops. They are trying to milk saps who can't tell the difference between SSDs (i.e. normal consumers) by not dropping prices... yet. The race to the bottom for SSDs is coming. The manufacturers are just greedy enough not to want it to happen too soon. Yeah no one's selling you 8TB for $400 anytime soon. Aside from the fact that the R&D costs for QLC need to be recuperated first & companies need to reinvest an increasing amount for future development, there's also a point after which it doesn't make sense for the SSD, or NAND, maker to sell these at a loss. "I doubt anyone will be rushing to the store to buy these."